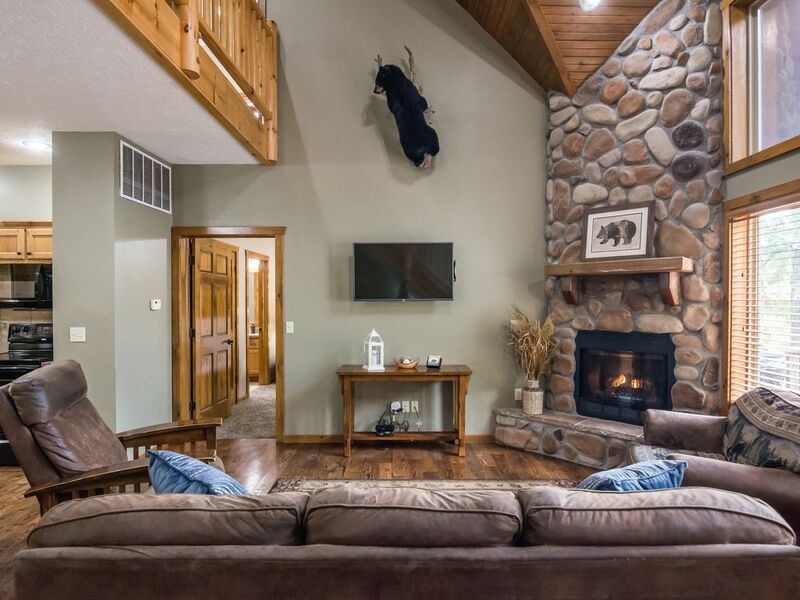 Black Bear Lodge is one of the latest of our distinctive vacation homes in Branson. This home with over 4,300 sq feet has seven spacious master suites, each with their own TV, and sleeps up to 24. Six suites have their own jetted tub. It's like having your own mini hotel for just your group. Located just 3/4 mile from Silver Dollar City and two miles from Indian Point marina, Black Bear Lodge is the perfect location for your family reunion or church group. If you need more rooms, our new Royal Moose Lodge is next door and also has seven master suites. The main level is wheelchair friendly and has towering cathedral ceilings with an open floor plan including great room with stone fireplace and big screen TV, extra large dining area, and fully equipped kitchen with convenient island and two full refrigerators. Granite counter tops throughout the house add a touch of elegance. The dining area by the kitchen has been extended and opened to another larger dining room. Step out onto the upper back deck which is open with Amish hewn log beams and railings. There you will find more dining and a gas grill for barbequing. There are two master suites, one wheelchair friendly, each with their own king bed, TV, and soothing whirlpool tub. There is a pull-out sofa in the great room. Climb the stairway with log railing to the upper level where you'll find two more large master suites, each with a king size custom log bed and full size pull-out sofa. These rooms each sleep four and have their own TV. Great for families with young children. Head down to the lower level where there are three more master suites, two which have a whirlpool tub, the third a shower. The family room has a tournament pool table, air hockey, and foosball table. There are two pull-out sofa sleepers with 7 inch mattresses and second stone fireplace with big screen TV. Step out onto the second back deck which is screened in. The ceiling fans keeps you cool while the screen keeps out bugs as you relax and listen to the sounds of nature. Black Bear Lodge has more distinctive features and high end quality furnishings. On-site community amenities include swimming pool with two water slides, kiddie pool, playground, hot tub, shuffleboard, horseshoes, and basketball goal. Off-site amenities such as indoor and outdoor swimming pools, hot tub, playground, basketball, and tennis, are available for our guests who stay at any of our Lodges. We have made arrangements with another resort, about 12 minute drive away, for our guests to be able to use all of their amenities. Perfectly located close to many shows, shopping, Ozark attractions, and Table Rock Lake, Black Bear Lodge, with its charm and amenities, is ideal for your family or group's next visit to Branson. We all enjoyed our stay, very nice bedrooms & bathrooms! The home was comfortable, loved the spacious seating @ dining room table, also game room in basement. Kitchen & island very adequate. Only request, we located iron but never did find the ironing board. Thank you for a wonderful place to enjoy our family together! Great for a big family. The house is unique in that it has 7 bedrooms and 7 bathrooms. We loved that we could all be in one house. We usually have to rent 2 houses or suites and hotel rooms. The kitchen was supplied with dishes and pots and pans large enough for a big family. The L shaped table was great for eating, playing games, puzzles and decorating Christmas cookies. The perks of the pool table, foosball table and air hockey were greatly appreciated. Reasonably priced is the icing on the cake. Great set up for our large family visiting the Polar Express and SDC for the Christmas holidays! We loved our stay at your beautiful cabin! Having 7 master suites in each unit were wonderful. We enjoyed the units very much! 24 members of the Johnson Family from Colorado, Oklahoma and Tennessee enjoyed staying at the Royal Moose and Black Bear Lodges for four nights. The lodges were clean, fairly new and nicely furnished. A few arrived after dark and had some trouble finding the place, but directions were good and I was able to lead them in. The weather was a bit drizzly so we weren't able to use the pool, hot tub or fire pit, but we'll try that next time. This was a perfect location for our high school reunion. Overall it is a good place to stay. We would recommend it to friends. Overall we liked the place and would stay there again if we came back. The only reason we would give 4.5 stars instead of 5 is the furnishings in the living room and on the decks. When staying for an entire week with 12 people there needs to be more comfortable furniture in the living room, like ottomans or additional loungers or maybe a sectional to provide more seating. Even a coffee table in the middle would help. The upper deck had very limited seating with just the one table and 2 benches. A large deck for only 6 seats. Otherwise it is set up very nicely for a large group. Each bedroom/suite had it's own bathroom which was very nice. Great dining room table for a larger group as well. 5 night minimum for 4th of July, Thanksgiving, Christmas week. Other holidays have a $50 additional holiday rate and include New Year's, President's Day weekend, Memorial weekend, and Labor Day weekend, all three night minimums. Holiday rate applies to every night of a stay in which a holiday is involved. Arrival dates and/or minimum night stays may vary according to dates already booked.